As we approach Canada Day and the 150th birthday of our country, I decided to take a closer look at our national anthem and how it applies to my life. “O Canada, our home and native land.” Canada is home to over thirty-six million people. More than 20% of these were not born in this country. Ours is a nation known for welcoming people from other lands. In my everyday life, I can learn from this example and be warm and welcoming to everyone, not just those with common experiences. Diversity makes life more interesting. “True patriot love.” This applies to love for our country. To me, this means to be proud of Canada and all it has to offer. Our standard of living is one many areas of the world would love to experience. I am grateful to live here. Do I appreciate the opportunities that are present in my life or do I grumble and complain about little things that inconvenience me? The many positives far outweigh the few negatives. “True north strong and free.” Our country offers us freedom of speech, freedom of religion and many other freedoms that are denied in other parts of the world. I never want to take these for granted. Do I appreciate the freedoms in my life or just think of them as my right? Maybe I deny myself freedom. When I look at mistakes I’ve made in the past and decide not to risk loving others, believing in myself or having dreams for the future, I am locking myself in a self-imposed prison. This denies me the life that true freedom offers. “We stand on guard for thee.” As Canadians, we may be called upon to defend our country and all it stands for. I don’t have to be in the military or law enforcement to do this. I can guard its reputation by the words I speak. O Canada was written over one hundred years ago, but its message is still relevant to my life today. 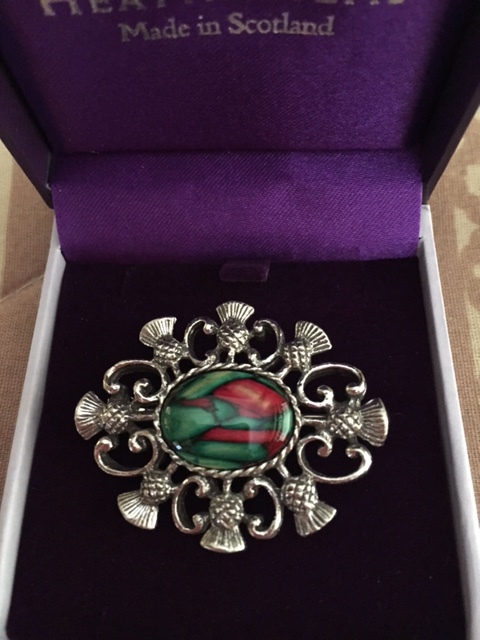 I opened a small box and admired the lovely brooch inside. Many eyes were on me as I was asked if I knew why this design was chosen for me. Our family has a Scottish heritage and the gift had come from Scotland but I figured there was more to it than that. Focusing on the design in the stone I struggled to see what images were there. My family laughed as I came up with some interesting interpretations. After a few minutes my son-in-law took pity on me and asked how many thistles surrounded the stone. That was the clue I needed. There were eight, one for each of my grandchildren. The stone itself was a Heathergem, made from the stems of the heather plant. Basically, the heather is picked, dried, died and then mixed together and compressed. Eighty tons of pressure is required to press the block of stems together. It was incredible to think this lovely stone was once the stems of a plant. The first lesson I learned from this gift was that sometimes I look so hard to find a complicated solution that I overlook the answer that is right in front of me. Lesson two was that pressure is not always a negative thing. It is not pleasant to go through times of intense pressure but this stone was evidence that the results can produce something of strength and beauty that would not otherwise be possible. I need to remember that God can take any situation and produce something good from it. I only need to give it to him and allow him to do his work.